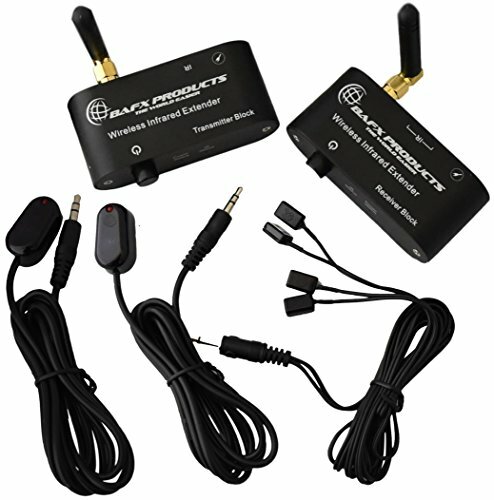 Hide your IR remote controlled devices completely out of sight! In another room, in the cabinet or wherever you can imagine! Does your remote control stop working if your cable box is 20' away but you want to put the cable box downstairs? Not a problem with our wireless remote control extender! Generally suitable for most homes 3-5,000 SQFT or less. Our wireless IR extender can span 50-300ft, depending on your homes contstruction which can reduce the distance it may span. Sit and change channels on the cable box while the box is in the basement and your upstairs. Simple to follow setup video, helpful technical support and an awesome, 1 Year manufacturer warranty from BAFX Products!